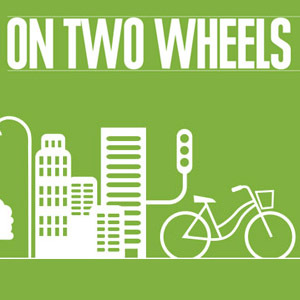 On Two Wheels: Victory for Cyclists! Last month, I was pretty anxious about the local referendum, which included a question about the desirability of more cycle paths in the city. Now, I am proud and happy: we made it! More cycling infrastructure was the clear (if slightly unexpected) winner, with more than 85 percent of voters approving the idea. The metro got just 55 percent support and 70 percent said ‘no’ to the Winter Olympics bid – the main reason for the referendum. The 175,000 votes for cycle paths were a heavyweight 53,000 more than the current Mayor of Krakow, Jacek Majchrowski, received in the mayoral runoff vote in 2010 that won him a third term in office. That’s a big shift and a political earthquake with long-term repercussions, especially since there will be elections to the Krakow City Council this autumn. While this earthquake has not yet produced any visible results (they will come), voting was a cycling experience in itself. Not all 85 percent who voted for more cycling infrastructure went to the polling stations on their bikes, but I’ve never seen so many parked outside – a clear example of the increase in cycle traffic. The official traffic count commissioned by the municipality last year produced confusing results. Cycling made up a mere 2 percent of all trips, compared to 3.56 percent in Wrocław three years ago and 1–1.5% in Krakow in 2004. Experts pointed out that late autumn was a bad time to measure the true extent of cycle traffic and the Kraków Miastem Rowerów (KMR) advocacy group did their own study, producing results that seem to be more in line with what we see on the streets (and with the outcome of the referendum). According to KMR, more than 5,000 cyclists rode through Rondo Mogilskie every day in May 2014, compared with 2,500 in September, 2011 (on good weather weekdays). On ul. Kopernika, they counted about 3,300 cyclists per day (a slight rise from 2012) with bicycles outnumbering cars 54 to 46 at peak hours. On the Dębnicki Bridge, the number of cyclist daily was about 4,000 – 25 percent up on 2012. Women constitute about 37 percent of all cyclists (no change from 2012). These figures will definitely increase when Nowa Huta is finally connected to downtown Krakow, with two cycle tracks, by the end of this year. This will be the first time these two halves of Krakow will be connected, with all bottlenecks removed. The mayor seems to be trying to downplay the referendum outcome, saying: “Krakow is second only to Warsaw and Wrocław in the length of its cycle paths.” This is a half-truth at best – Krakow ranks very low if you consider the length of its cycle routes as a proportion of the extent of the city’s road network. Let’s not forget, the results of the referendum are legally binding. Political decisions must be made. Funding for cycling must be increased, and a comprehensive master plan to connect southern and northern districts with the downtown area developed. Cycle superhighways on ul. Kamieńskiego, ul. Wielicka, ul. Wadowicka and ul. Zakopiańska and a cycle-friendly refurbishment of the Nowy Kleparz junction are obvious projects that should be implemented as soon as possible. The struggle (and the celebration) is not over yet. I have moved here in Krakow since 1 week (but I have been in Poland already). After 3 years spend in Amsterdam, I cannot drop my bike anymore. I have definitely seen an increase in bike on the roads in Krakow (and that’a a good news) but compared to other cities, we’re still far behind! Drop the car, use the bike!